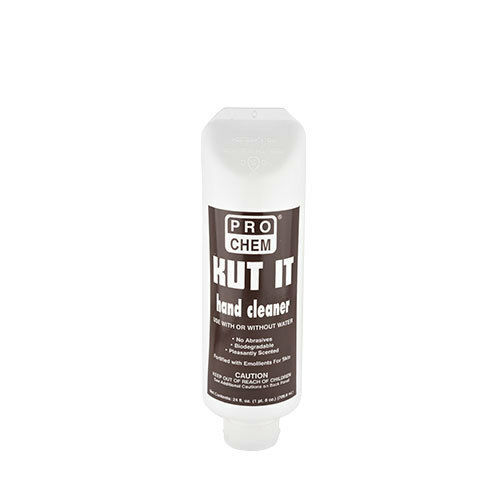 KUT IT | Pro Chem, Inc.
KUT IT is a highly effective hand cleaner with emollients to leave hands that are in contact with harsh and abrasive chemicals soft and pleasantly scented. It contains no abrasives, phosphates or caustics. It can also be used with or without water. Available in convenient 16 oz. hook tubes. Use with or without water. To use without water, squeeze a small amount into hand. Rub hands together briskly being sure to cover hands completely. Work hand cleaner into areas between fingers and under fingernails. Wipe off with towel or rag. A second application may be necessary for very hard to clean soils. To use with water, wet hands before using and follow directions above. Rinse with water and wipe off with rag or towel.